A rover of great determination and toughness, Noel Carter was a VFL premiership player at 18 years of age. He later journeyed to WA and captained South Fremantle to three consecutive WAFL Grand Finals – including a famous premiership – in the process becoming one of the club’s favourite sons. Born in 1955 in Ulverstone, Carter was a highly-talented junior footballer, captaining Tasmania at the 1969 and 1970 National Schoolboys Carnivals, also winning All-Australian selection on each occasion. Carter made his senior debut for the Ulverstone in 1971, and his reputation exploded the following season when – aged just 17 – he won Ulverstone’s senior club champion award, was a regular NWFU intrastate representative and impressed to such an extent that some considered him unlucky not to have been picked for Tasmania for that year’s National Carnival in Perth. Carter’s exploits had certainly captured the attention of VFL clubs, and Richmond administrator Alan Schwab personally flew down to Tasmania in an attempt to sign him. He was successful in his efforts, and Carter joined Richmond ahead of the 1973 VFL season. Initially playing reserves footy for Richmond, Carter made his senior debut in Round 10 before returning to the reserves until late in the season. Recalled to the senior side in Round 20, he retained his place until the end of the year, culminating in Carter being a member of Richmond’s 1973 premiership win over Carlton, one of four Tasmanians in the Tigers’ team that day. Carter was a regular but not permanent fixture in the Richmond senior team over the following four seasons, playing mainly as a roving pocket forward. At the end of 1977, Carter – seeking more opportunity – departed Punt Road to join WAFL club South Fremantle. His first season with the Bulldogs was a great success, with Carter playing 23 games and finishing third in the club goalkicking. So impressed was South Fremantle in Carter’s form and leadership ability that the 24-year old was appointed captain for 1979. Carter subsequently led the Bulldogs to a Grand Final in his first season in charge, the famous 1979 ‘Derby’ Grand Final against bitter rivals East Fremantle; in front of a record crowd of 52,781, the Bulldogs went down 21.19 (145) to 16.16 (112) in a game widely regarded as the greatest WAFL Grand Final of all time. 1980 was arguably Carter’s best season. As well as captaining South Fremantle to a premiership thanks to a 58-point win over Swan Districts, he also took out the South Fremantle Best & Fairest award and finished runner-up to teammate Stephen Michael for the Sandover Medal. In 1981 Carter and South Fremantle again tasted Grand Final defeat, this time kicking themselves out of the game with 12.24 against Claremont; only weeks before Carter had booted 11 goals out of South Fremantle’s still-record WAFL score of 40.18 (258). This period also saw Carter as a regular interstate representative, turning out for Tasmania at the 1979 and 1980 State of Origin Carnivals before captaining Western Australia in games against Victoria and South Australia in 1981. 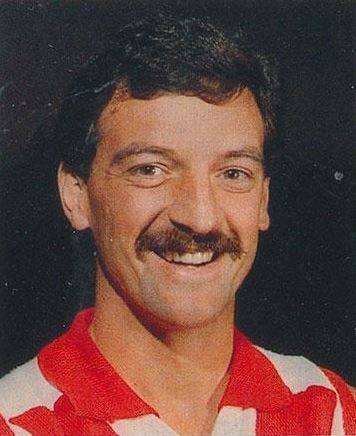 Carter relinquished the South Fremantle captaincy at the end of 1982. After claiming a second club Best & Fairest in 1984, he re-assumed the captaincy for one year in 1985, retiring at season’s end after 258 senior games in three states. Post-career, Carter served as a South Fremantle and WA state selector for a time, and also coached the Perth reserves side for one season. In 2011 he was an inaugural inductee of the South Fremantle Football Club Hall of Fame.